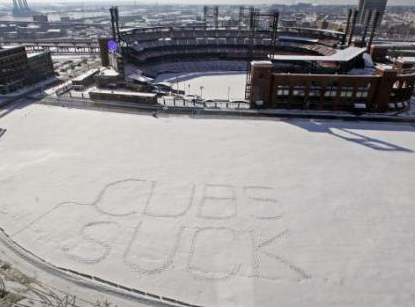 What do baseball fans do when their team gets snowed out? Interesting question. So I thought in the interest of banishing boredom, I’d postulate some... possibilities. 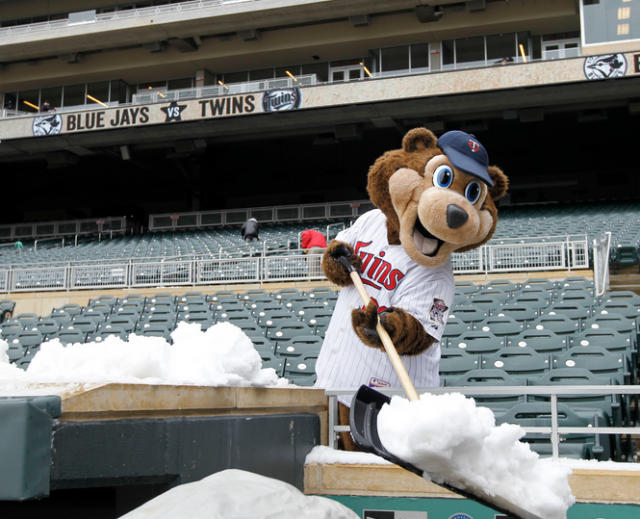 1) Pick up a shovel and head down to the stadium. If you can’t beat ‘em, join ’em. Just don’t lick the seats. And be sure and take along some cash just in case the team has slashed beer prices in half. 2) Paint your balls black. I’m talking baseballs here. Just thought I’d clear that up before somebody goes too far. Anyway, take said black baseballs out on the back deck, along with your favorite Nellie Fox bat, and try knocking linedrives through your neighbor’s windows. Take along some cash just in case you succeed and your neighbor doesn’t find broken windows in the middle of a blizzard humorous. 3) Go on U tube and watch your team’s last World Series win. This could prove to be a step way back in time so brace yourself for some strange looking fans. They may not be totally decked out in team paraphernalia (I had a phernalia once, just never had a pair), their billfolds won’t be empty and they’ll be posing with Wally the Beerman instead of players. They may or may not be intelligible. 4) Oh, and the same pitcher might still be on the mound in the 9th, or later, innings. I know, weird, but what the hell did anyone know about true baseball back then? And don’t expect to get circled. On the screen I mean. Getting circled by empty beer cans is okay. 5) Wax philosophical on TD. I tried buying some philosophical wax down at the auto store once. My request went way over their heads so don’t bother going there if you don’t know no philosophy. In that case you’re better off sounding like an idiot anyway. Idiots, I’ve discovered over the years, have some pretty interesting theories. Like when this undiscovered planet is going to appear out of nowhere and crash into the Earth next week ending life as we know it. Which considering the weather wouldn’t be all bad. Unless of course you have season tickets. 6) If you’re really, really bored, tackle the top half dozen items on your Honey-Do List. Maybe if you do, your honey will. Reminds me of that old Beatles tune; Honey Don’t. Ringo Starr did the vocals. I don’t think he was married. So there you have it, so have at it. Let’s hear your Alternative Uses of Cancelled Game Time. Winner gets his ticket punched. I'm feeling nostalgic and want to watch videos of Chris Gimenez pitching again. But really, all these postponed games, snowouts, or whatever they hell they are called, have seriously caused me to feel depressed this weekend.Three straight days with no games?!!! Please, please, please, let's play ball again! Edited by Doctor Wu, 15 April 2018 - 08:41 AM. I’m reading about Beer and Philosophy. Edited by Craig Arko, 15 April 2018 - 08:58 AM. The entire AL Central was postponed today. some smart guy on twitter calling it a colon-oscopy. Edited by mickeymental, 15 April 2018 - 07:54 PM. There are going to be a lot of messed-up schedules including inconvenient doubleheaders this year. 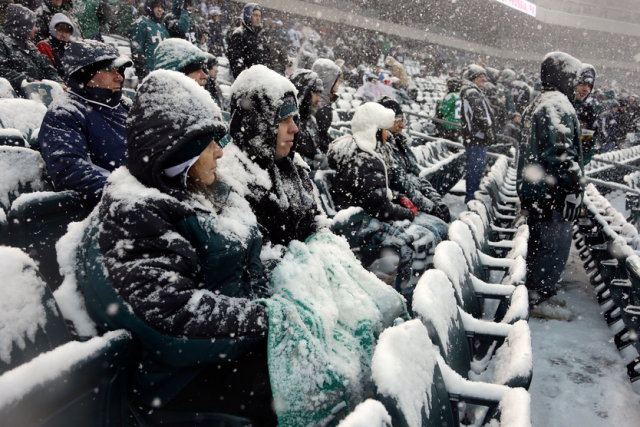 Coming Attractions: later this season at a ballpark near you, An Inconvenient Doubleheader. On a positive note: extra games being pushed back to later in the season means someone other than Hughes should be ready to take a spot in the rotation.